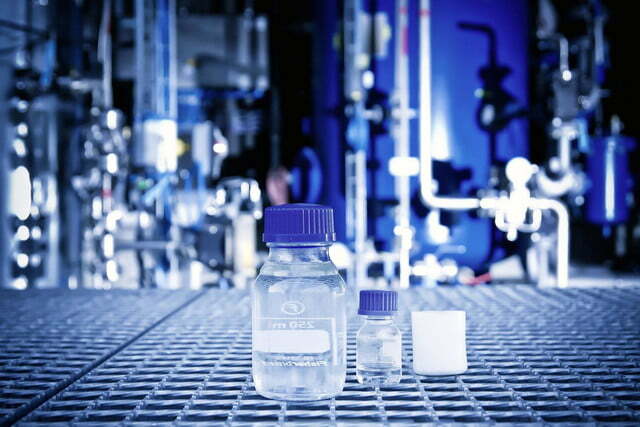 Have Audi engineers just invented the fuel that will save the internal combustion engine? Audi’s futuristic factory in Dresden, Germany, produced its first batch of high-quality diesel a couple of days ago. That might not sound impressive at first – Shell has been turning dino juice into diesel for decades – but the fuel in question is a brand new synthetic diesel made primarily from water and CO2. Audi has been kind enough to break the process down for us. First, water is boiled to form steam that is then electrolyzed at nearly 1,500 degrees in order to separate the hydrogen and the oxygen. 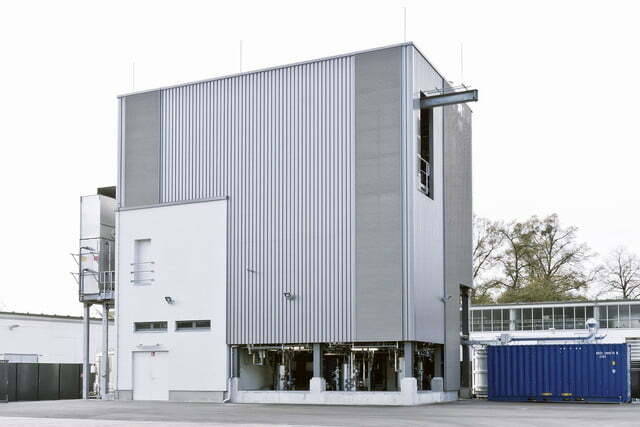 The oxygen is released back into the atmosphere, while the hydrogen is set apart and transferred to a synthesis reactor where it reacts with CO2 supplied by a nearby facility. Called blue crude, the end product is similar to the crude oil obtained when companies like Shell and Chevron refine mineral oil. Audi refines it, too, and ends up with a new synthetic fuel dubbed e-diesel. The fuel is free from sulfur and aromatic hydrocarbons, two pollutants commonly found in regular diesel fuel, and it is produced in a factory powered exclusively by green energy such as wind and solar. All told, Audi promises that e-diesel can make it possible to drive long distances without having a negative impact on the environment. 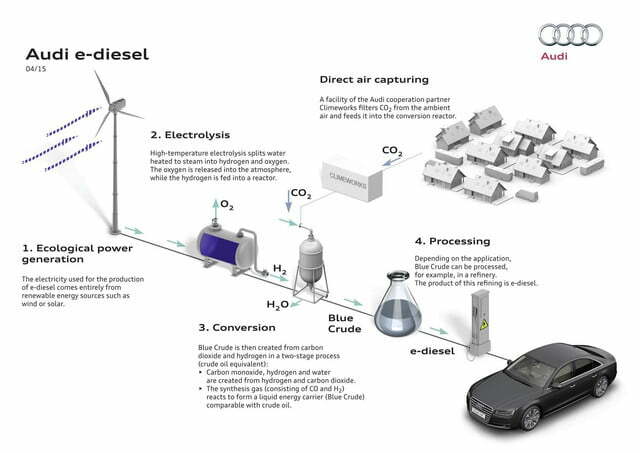 Audi’s e-diesel can be safely mixed with standard diesel, or it can be used to power an oil-burning engine by itself. 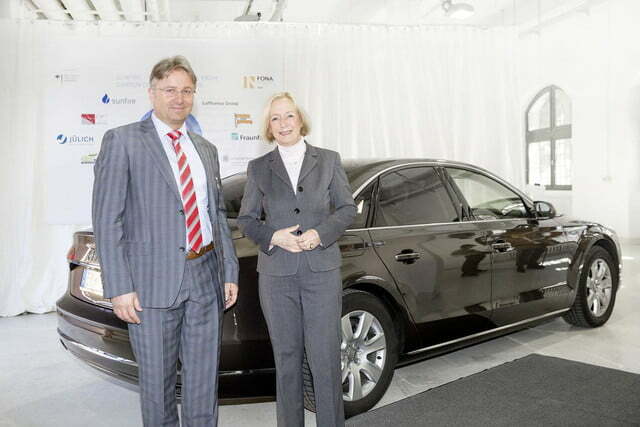 Prof. Dr. Johanna Wanka, Germany’s Federal Minister of Education and Research, put the automaker’s first batch of 1.3 gallons in the tank of her Audi A8 3.0 TDI to demonstrate how it works. Audi isn’t stopping at one tiny batch. The automaker has announced that it will produce nearly 800 gallons of e-diesel in the coming months as part of a pilot program whose main task is to gather data about the synthetic fuel. If everything works as planned, the internal combustion engine might have just gotten a new lease on life.